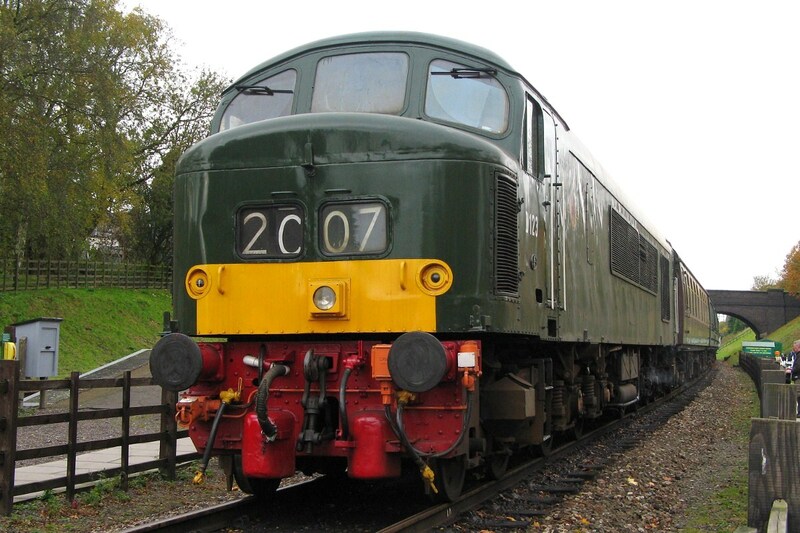 A selection of pictures of classic diesels in Sunday service at the Great Central Railway. Further coverage. Metro-Cammell Class 101 50321 (April 1958) leads into Quorn & Woodhouse with the 09:40 from Loughborough. The 101 is a power-twin, and here 51427 (February 1959) leads the return 10:10 from Leicester North, arriving at Quorn. D123 Leicestershire and Derbyshire Yeomanry (Crewe, October 1961, later ETH fitted 45125) arrives at Rothley with the 13:00 from Loughborough. 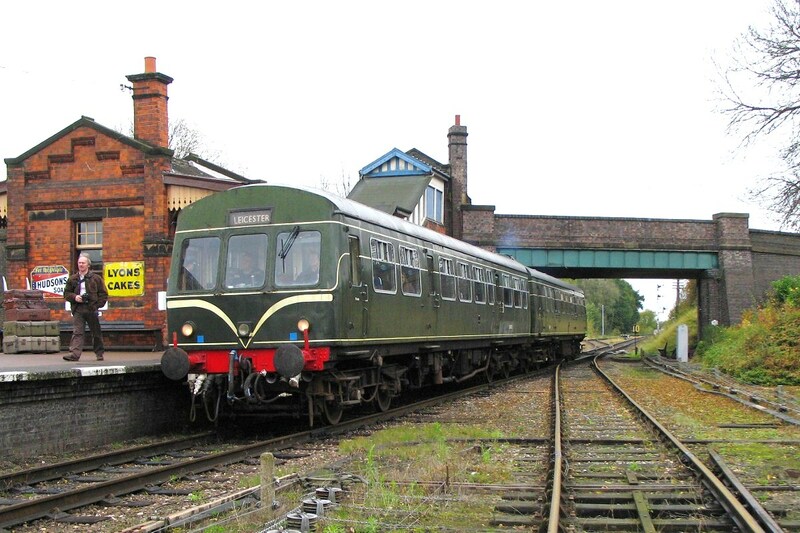 28th October was its 50th anniversary of its release into traffic allocated to 17A Derby. MADE IN LOUGHBOROUGH. 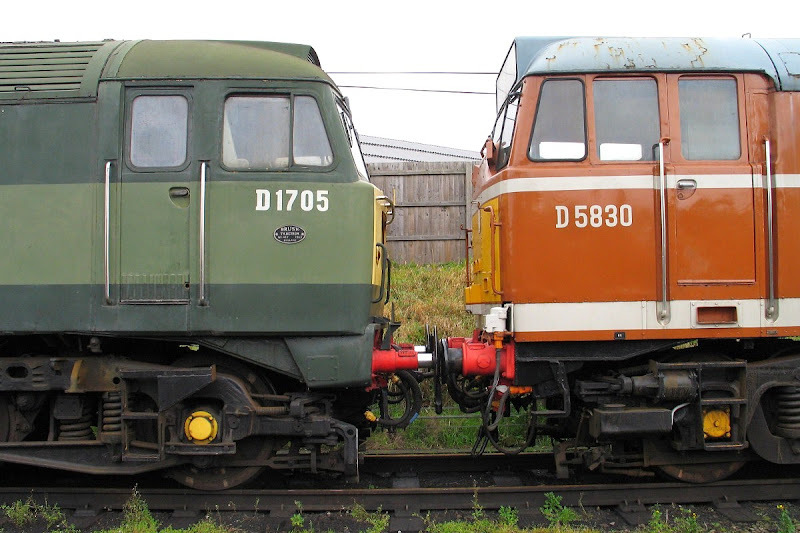 D1705 Sparrowhawk (Brush, November 1965 as a Class 48, later 47117) and D5830 (Brush, January 1962, later 31297 then, from February 1985, 31463 & 31563). 37198 is seen at Quorn & Woodhouse, and is expected to leave the GCR shortly - likely for use at a Network Rail location. 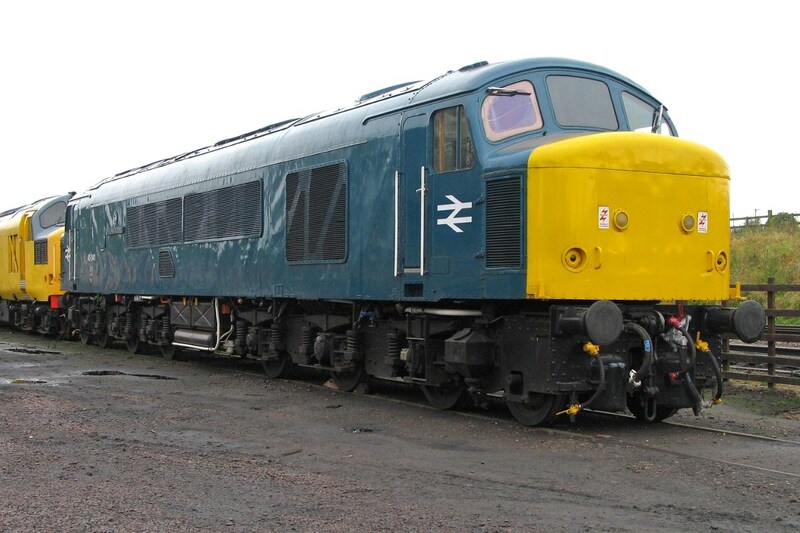 The locomotive is the fifth Class 37 owned by Network Rail, and was formerly preserved, initially by BRE Ltd at Wensleydale, but ended up at EMR Kingsbury (a scrapping location) in November 2007, then was moved to the GCR in April 2008. 37255 of Nemesis Rail was also present. 45041 Royal Tank Regiment (built as D53 at Crewe, June 1962) has arrived at the Great Central from the Midland Railway Centre, and has received electrical repairs. 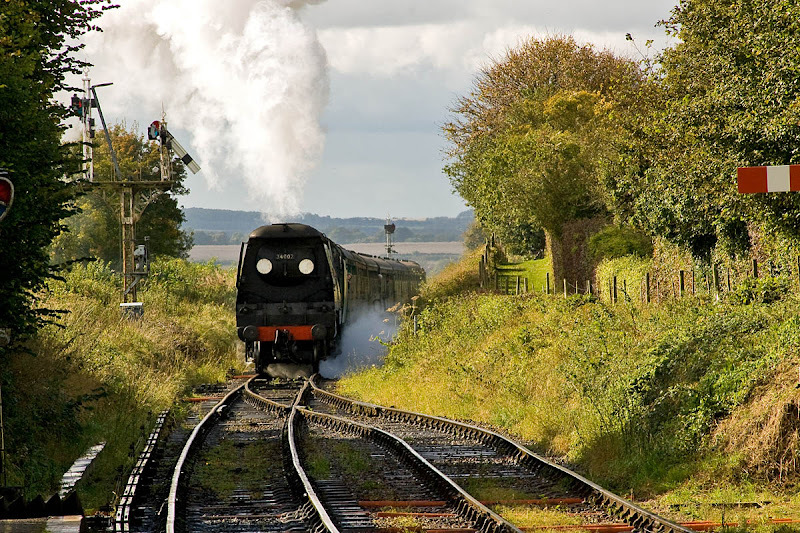 A late October Sunday spent on the Great Central Railway. A fuller set of pictures can be found here. 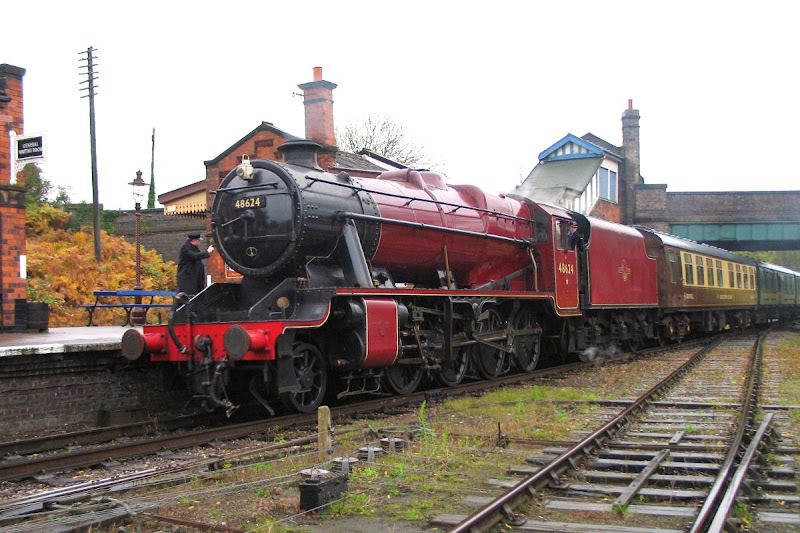 Red LMS 8F 48624 (SR Ashford 1943) arrives at Quorn & Woodhouse in rainy conditions with 15:15 from Loughborough. 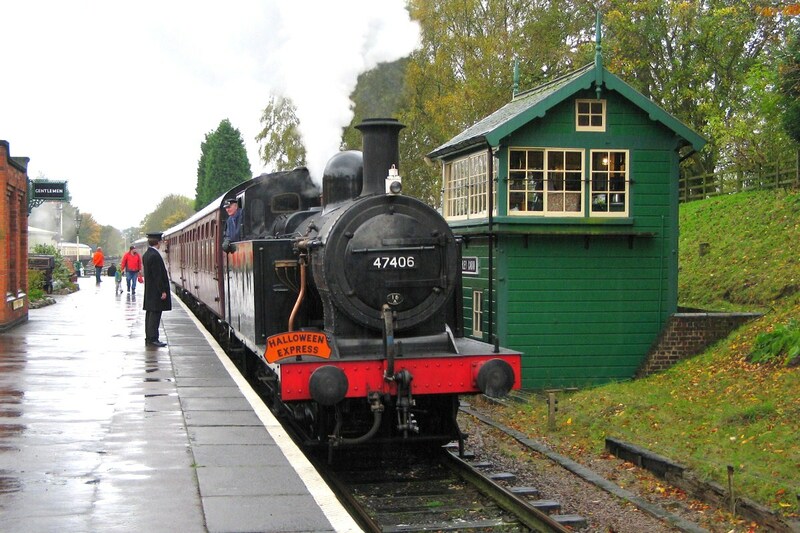 LMS 3F 47406 (Vulcan Foundry, 1926) arriving at Rothley from Leicester North with the "Halloween Express". 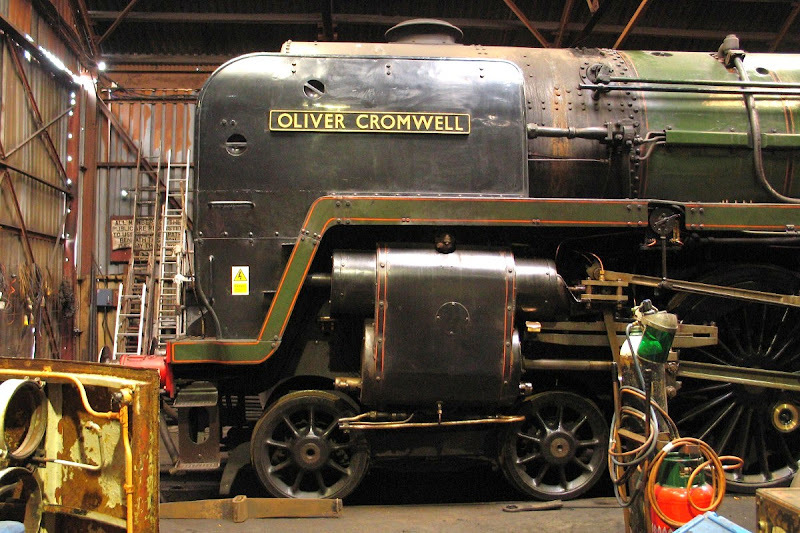 70013 Oliver Cromwell in the shed at Loughborough. 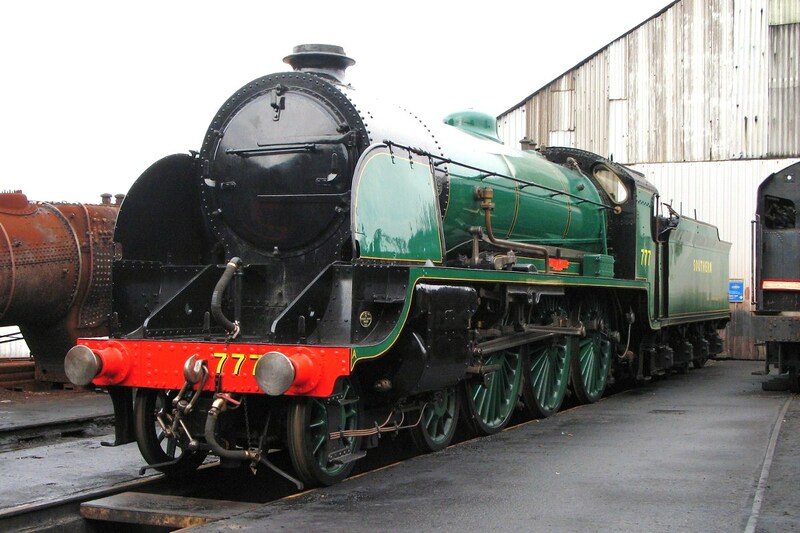 Newly repainted into a 1930s Malachite Green is SR N15 777 Sir Lamiel. 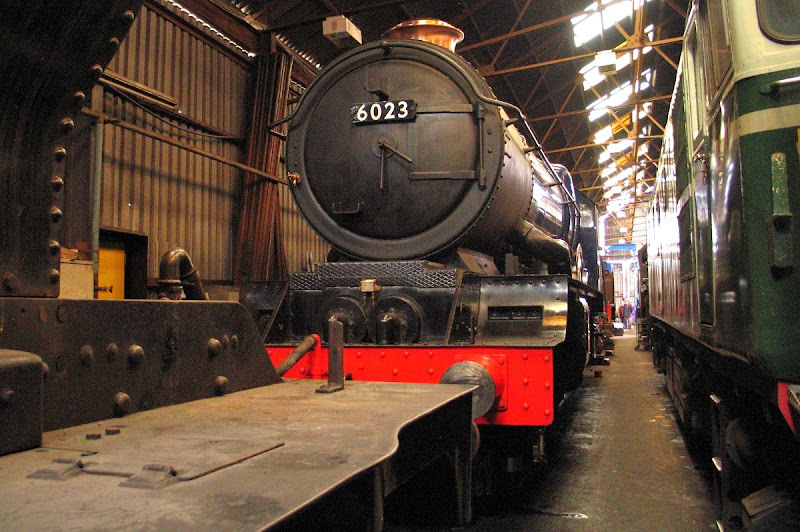 GWR 'King' 6023 King Edward II has arrived at Loughborough from Didcot for completion of repairs. Some pictures from my archive, inspired by reading the new book by Kevin Robertson and Hugh Abbinnett. 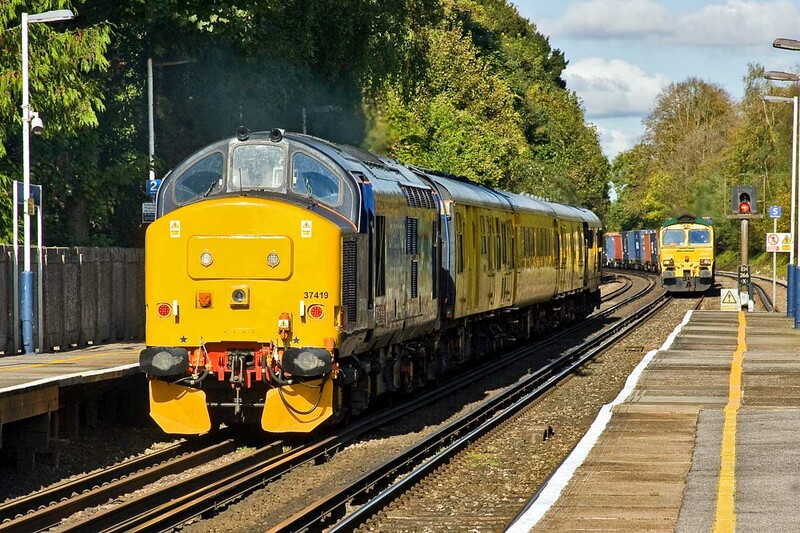 All of these units were built by BR at Eastleigh, using underframes from Ashford. 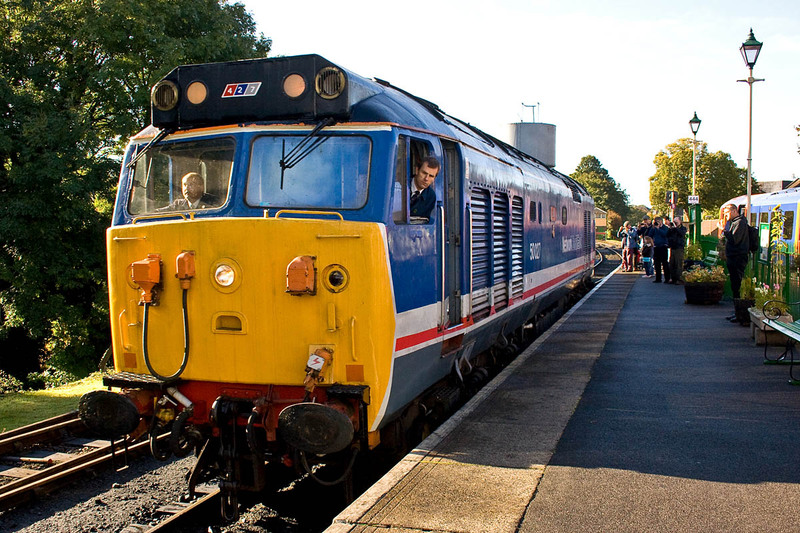 From when I travelled on them in the 1980s, my remaining impression is of the smell of carbolic through the passenger area. 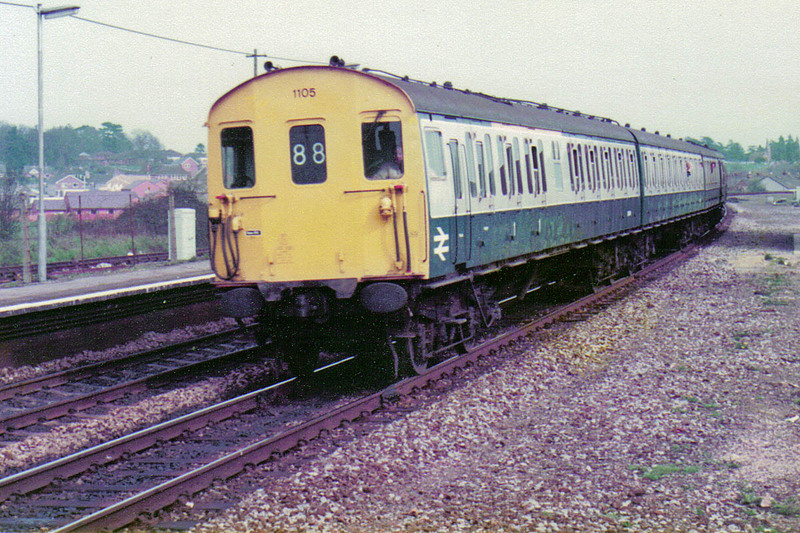 3-H 1126 of Eastleigh, at Dunbridge, 10th September 1982. 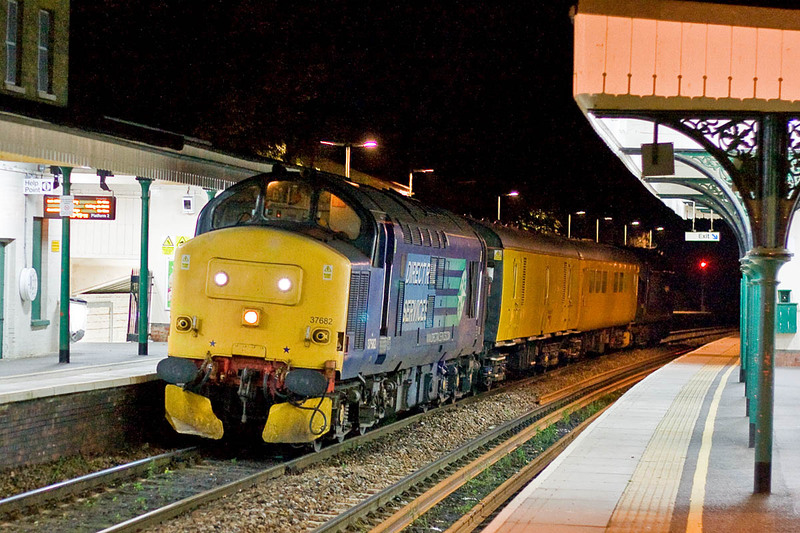 Headcode 88 = "Portsmouth Harbour - Salisbury/Westbury (semi fast) via Netley". 3-T 1402 at Salisbury, 18th September 1982. 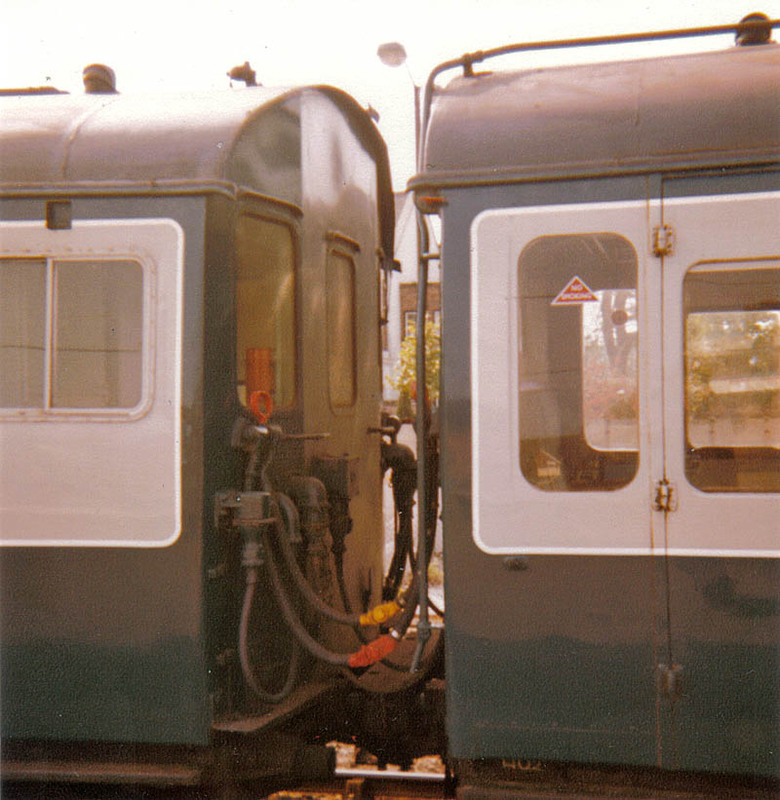 This shows the connections at the disused cab of the former Tadpole, former EPB coach 77508 used as a trailer from February 1980 when added to what had been two coach 1122, originally built in 1958 for Hastings duties. 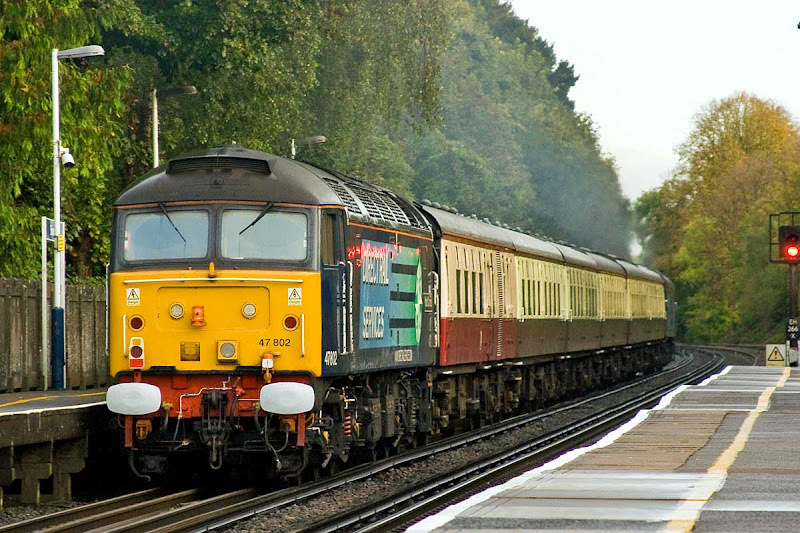 The formation of the Eastleigh allocated unit was 60121 + 77508 + 60821. 60121 was new in June 1958, withdrawn November 1987 and was disposed of at Vic Berry, Leicester in March 1990; 77508 originally in 2-EPB 5709 from May 1954, was formed into Tadpole 3-R 1205 in January 1965, withdrawn in November 1987 and was disposed of at Mayer Newman, Snailwell in January 1989; 60821 was new in June 1958, withdrawn in November 1987 and was disposed of at Mayer Newman, Snailwell in December 1988. 3-H 1126 again, at Romsey on 9th January 1983, on an 87 service 'Portsmouth Harbour - Salisbury or Westbury (slow) via Netley'. 1126 formed 60125 + 60671 + 60825 was new in December 1959 and finished service as 205026 in November 1990, with disposal coming at Mayer Parry, Snailwell in January 1992. 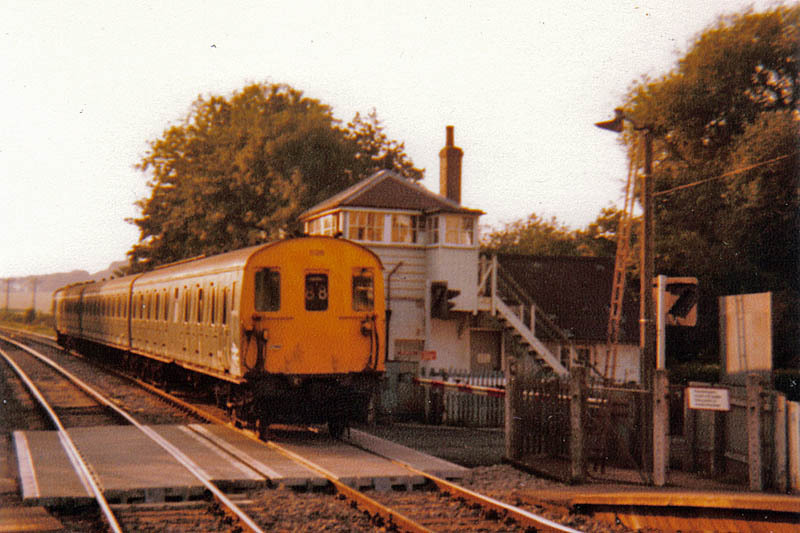 3-H 1105 of Eastleigh approaches Romsey on 16th April 1983. 1105 entered service as a 2-H formed 60104 + 60804 in August 1957, and TSL 60654 was added to make the unit into a 3-H from October 1959. 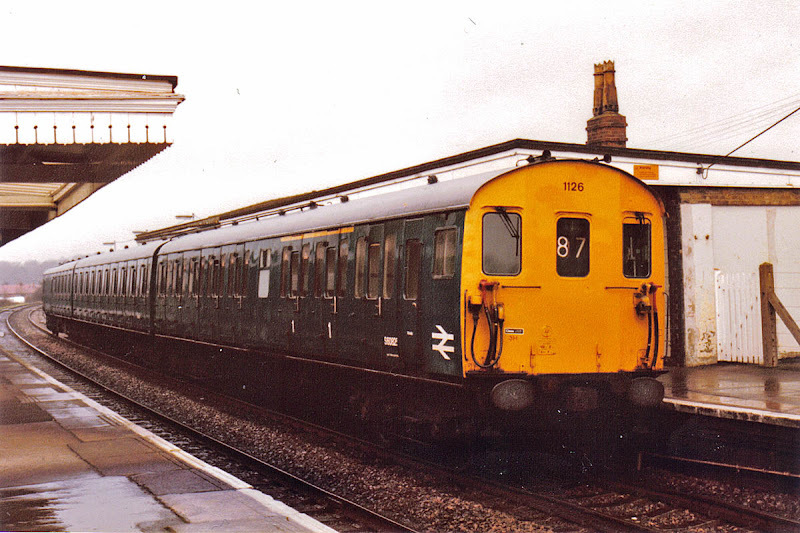 Renumbered to 205005 in August 1986, the unit was withdrawn in August 1987. 60104 was disposed of at Vic Berry, Leicester in March 1990, and the other cars at Mayer Newman, Snailwell at February 1989. 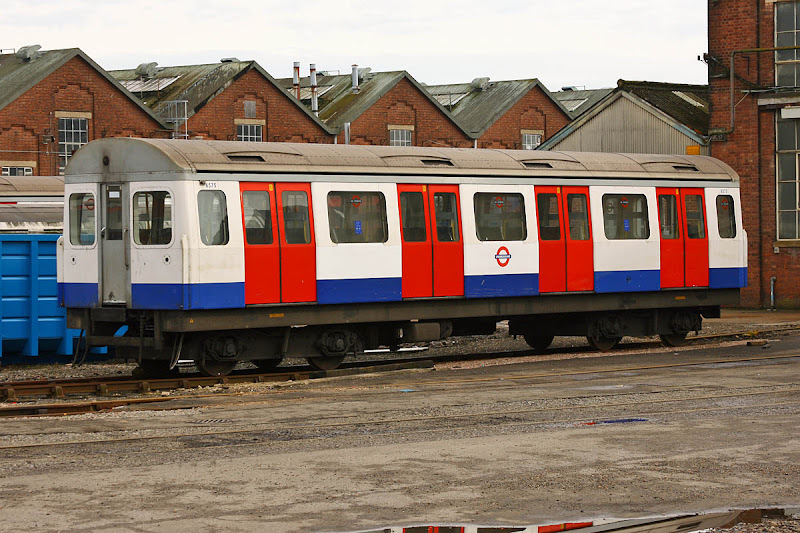 Reading this thread on District Dave's London Underground Forum, the first C69/77 stock to be sent for scrapping included this coach 6575. The train 5532 + 6532 + 6575 + 5575 was involved in a side-swipe incident, however all of the remainder of this stock will now be following it to scrapyards. There is some video of the train being moved under its own power to Northwood, which was then followed by road transport, also seen on more video. The C69 stock started service in September 1970 on the Circle and Hammersmith & City Lines, and was constructed by Metro-Cammell at Washwood Heath. 31106 and 37038 at Eastleigh Works, 20th October, 37038 + 37606 were expected to leave on 1Z14 to Hither Green but this did not run. 37038 is the last old liveried DRS locomotive, and was new to Hull Dairycoates as D6738 on 11th May 1962. 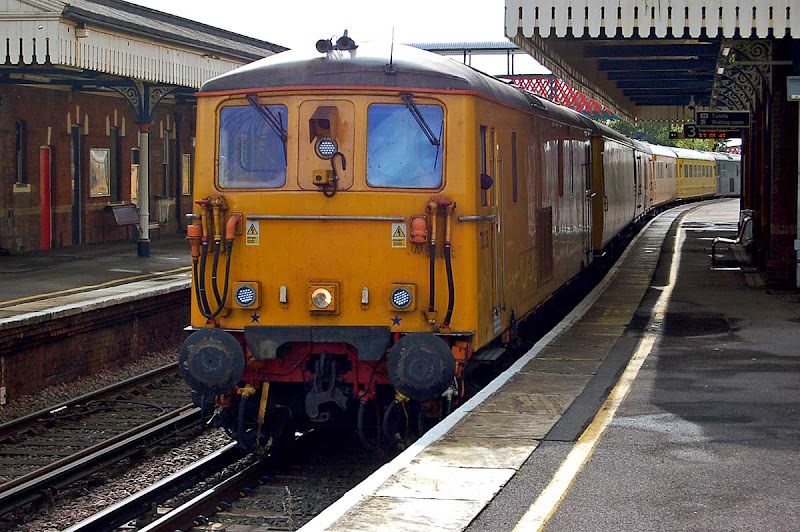 Stored by EWS in March 1999 and sold to Ian Riley, then DRS in May 2003. 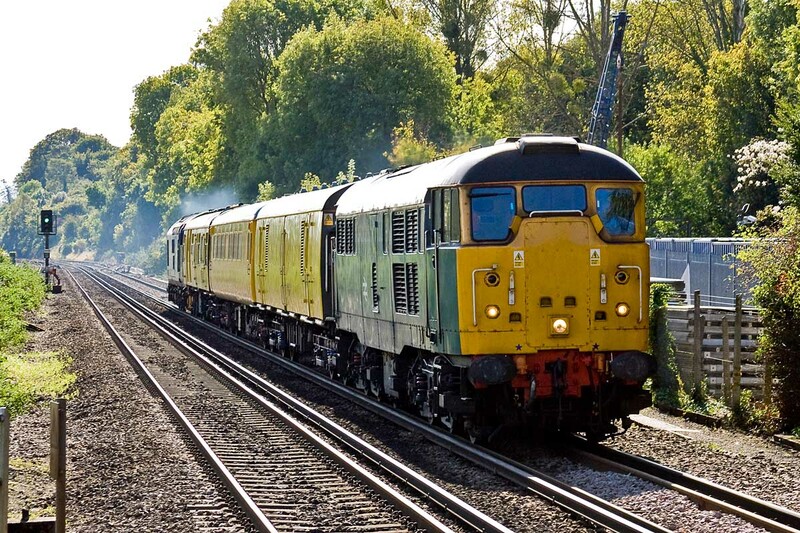 73107 Redhill 1844 - 1994 at St Denys, 17th October. Image by Ian Knight. 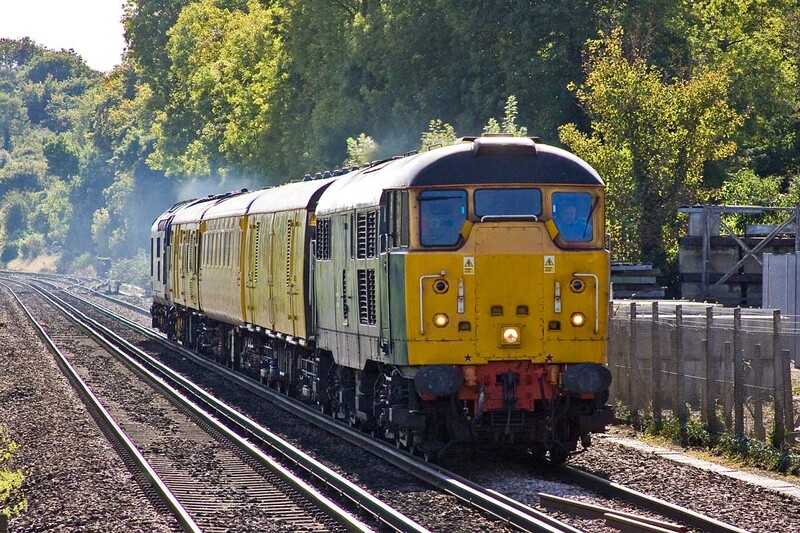 73138 at St Denys, 17th October. Image by Ian Knight. 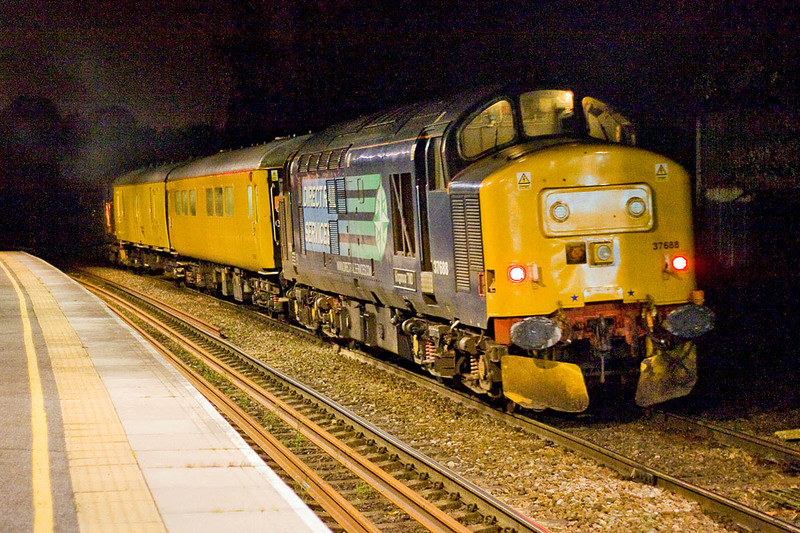 70019 with 4M61 12:51 Maritime to Trafford Park - which failed at Northam Jct and was rescued by 66516. Image by Ian Knight. 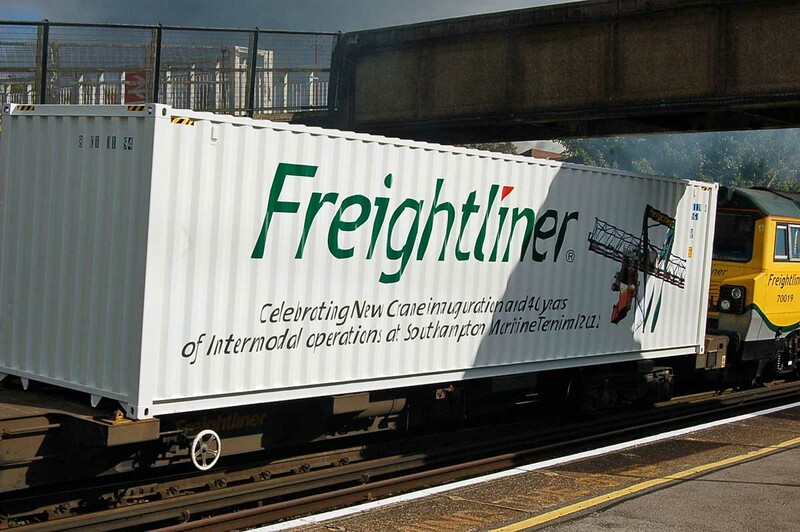 Special container celebrating new cranes and 40 years of operation at Southampton Maritime. Image by Ian Knight. Also at Bsingstoke. 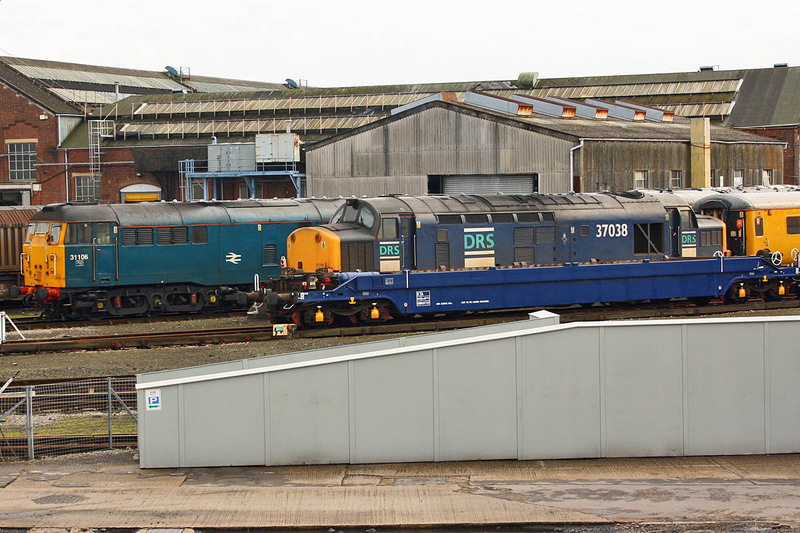 Saturday 20th October: 37038 + 37606 still at Eastleigh Works, also 31106. 70014 (FL HeavyHaul) has suffered an electrical fire. 70099 has arrived. Will we see it at Southampton? Colas, GBRf? Some steam age activity while Lion was on the extra diagram on Saturday 13th. There is a fuller gallery at this link. 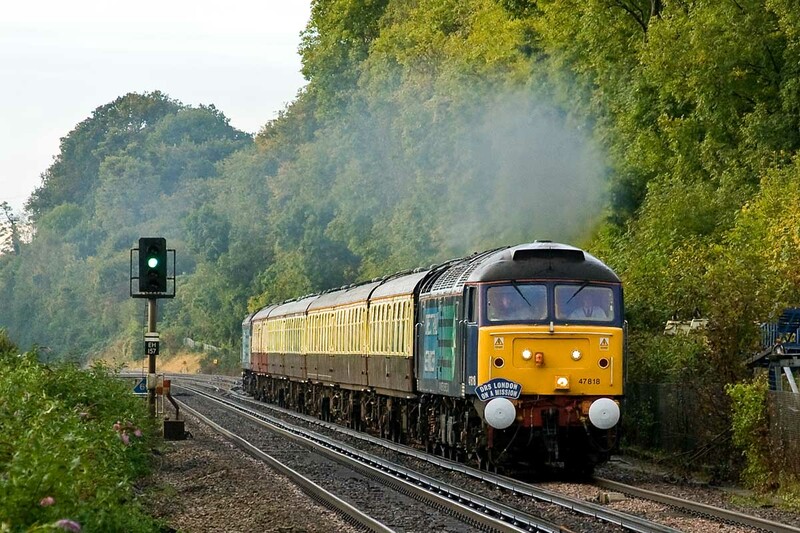 34007 Wadebridge approaching Ropley amongst autumn shades. 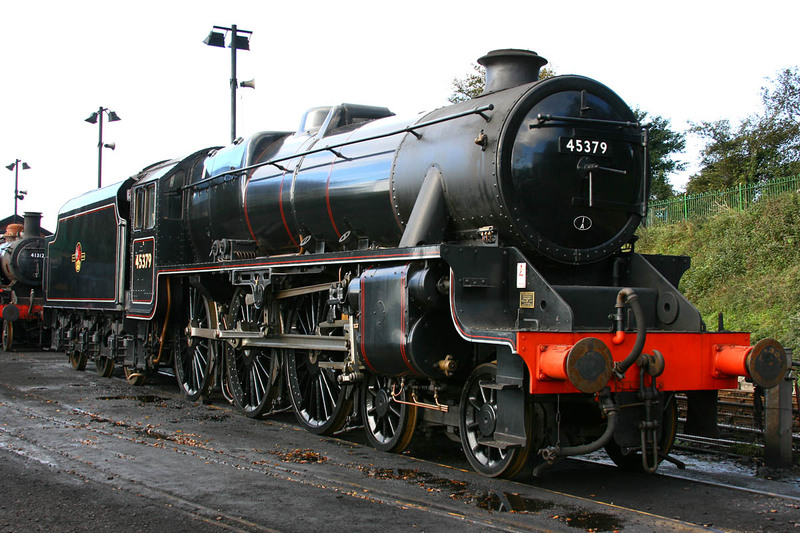 45379 has been to the West Somerset, and has been returned facing 'Up'. 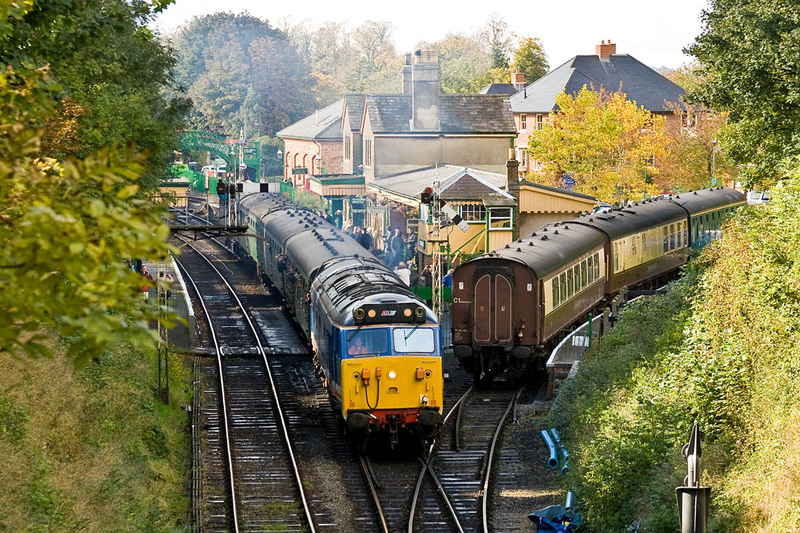 850 Lord Nelson arriving at Ropley from Alton. I believe that this is the second oldest Mk 1 on the Mid-Hants, 3769 is a TSO built at York as part of Lot 30079 completed in December 1953, and later fitted with Commonwealth bogies. 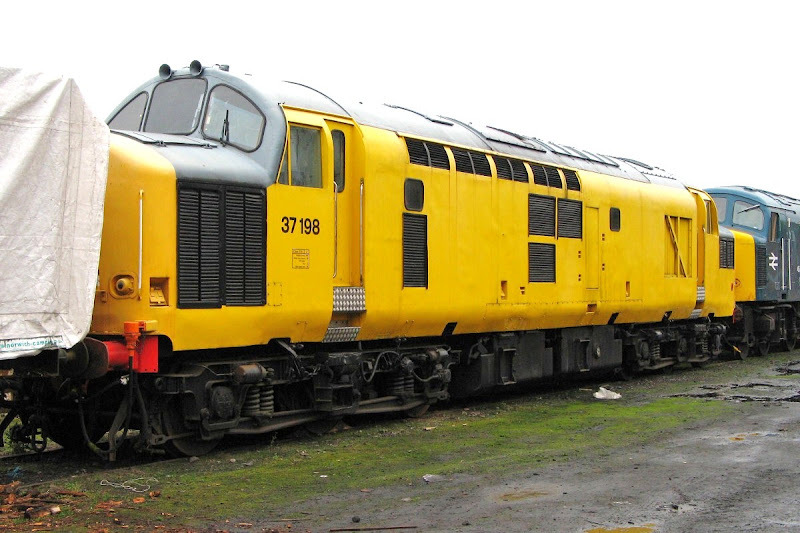 37682 - completed at EE Vulcan Foundry in April 1964 as D6936 and allocated to Landore. 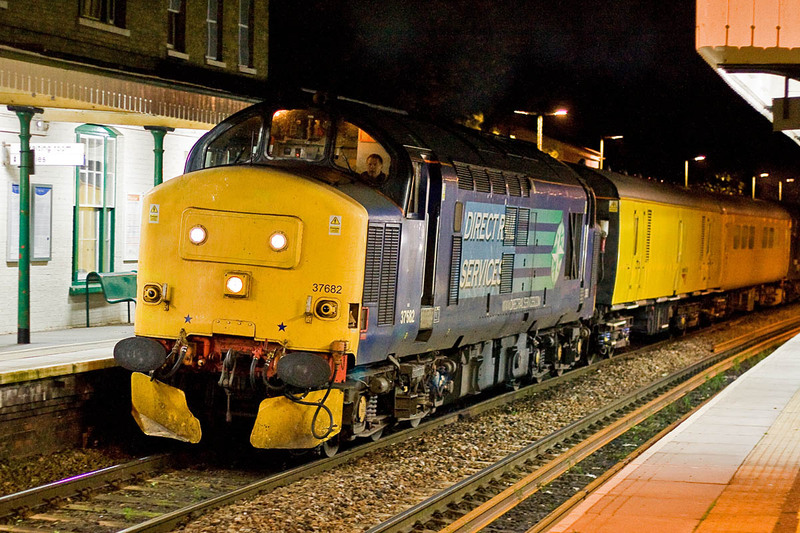 Later renumbered to 37236. Rebuilt and renumbered to 37682 in March 1987 at Crewe. Last worked for EWS in 2004, then sold to HNRC in November 2007. Returned to traffic with DRS from January 2009. 37688 - completed at EE Vulcan Foundry in November 1963 as D6905 and allocated to Landore. Later renumbered to 37205. Rebuilt and renumbered to 37688 in February 1987 at Crewe. last worked for EWS in 2003, then sold to DRS in November 2005. 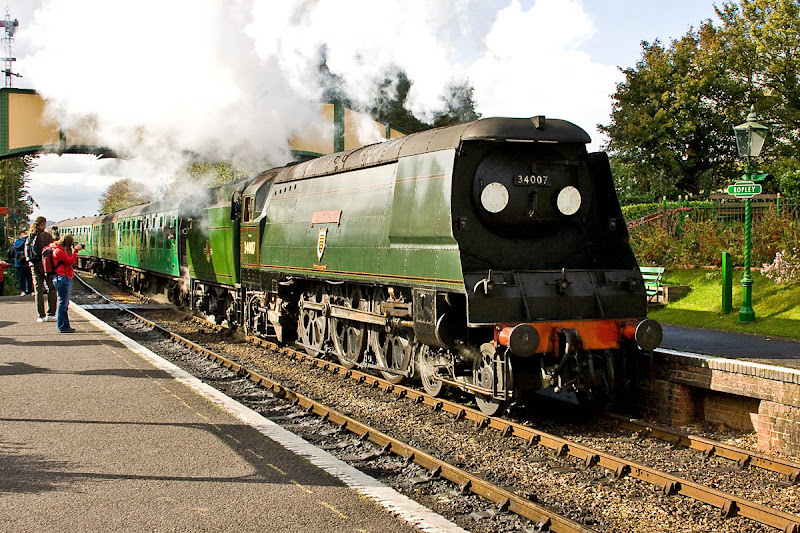 Returned to traffic from July 2007 when named at Kingmoor open day. 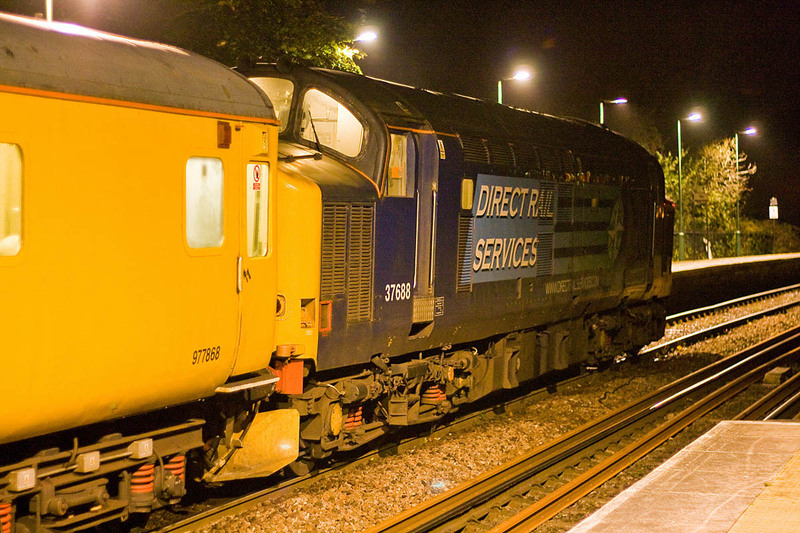 977868 and 6264 - details are in my entry from 6th October. 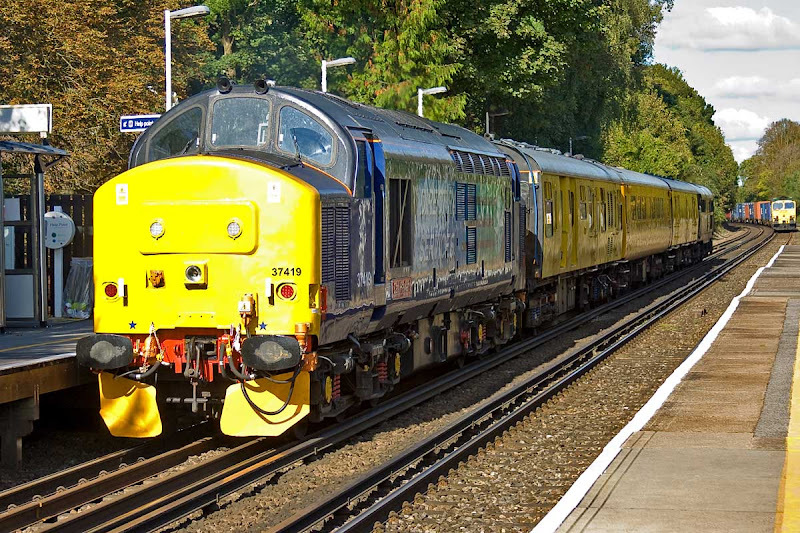 37682 starts away from Romsey, with the rare R for Redbridge route shown in the signal here, as most trains leave for Eastleigh. 37688 on the rear of the formation. 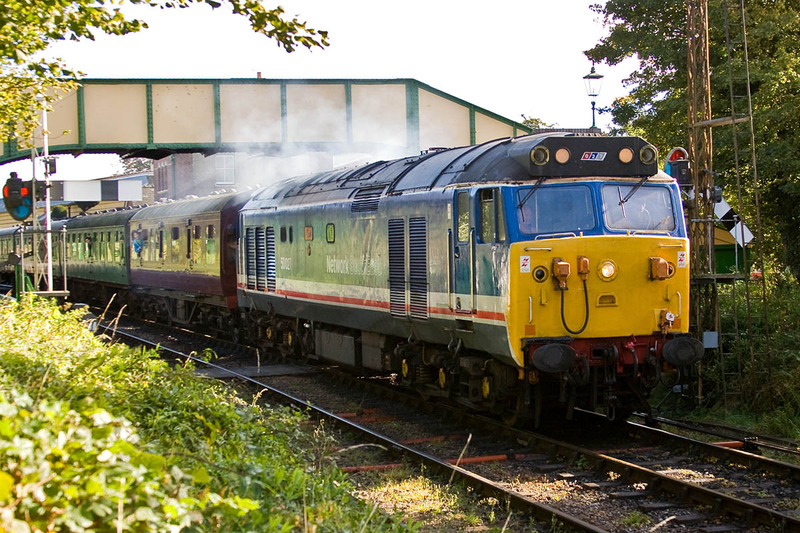 The first running day for 50027 Lion, in generally good autumn weather, apart from one shower just when Lion was about to make its departure from Ropley. My gallery with a full set of pictures can be found here. 50027 was built at English Electic Vulcan Foundry, and entered traffic as 427 to D05 (Stoke Division) on the LMR from 15th June 1968, later CD (Crewe Diesel). Reallocation to the WR followed in March 1974, with allocations to BR (Bristol Bath Road), LA (Laira), OC (Old Oak Common) and LA again. The locomotive was named on 17th April 1978. It went to Doncaster Works for refurbishment on 7th February 1983, work commenced on 2nd March, and the locomotive returned to traffic ~27th July. 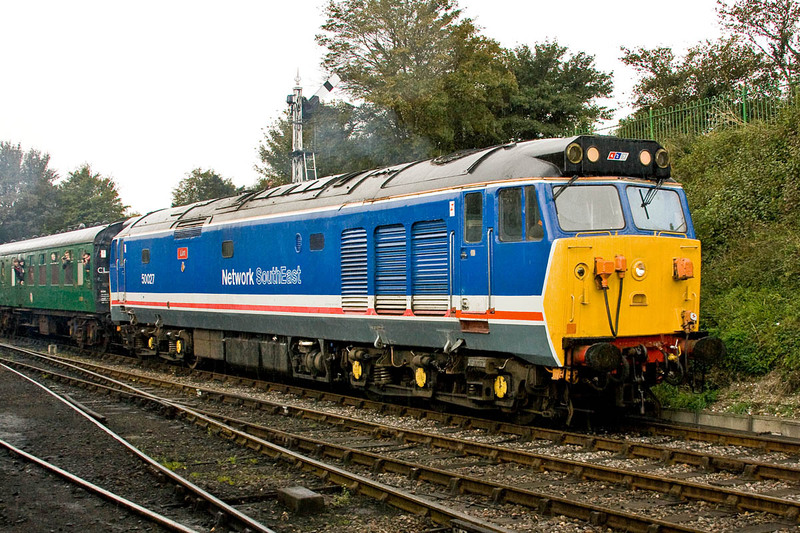 Network South East Livery was first applied following an F-exam at Laira, completed in December 1987. 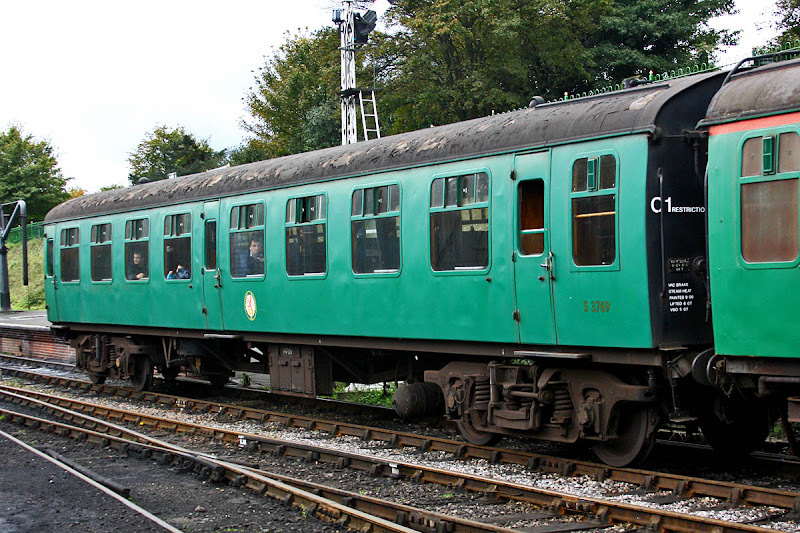 The locomotive was withdrawn in July 1991, and entered preservation in January 1992. Leaving Ropley in the rain, with the second working to Alton. Arriving at Alresford to take up duty in the morning chill. No ETH stock! 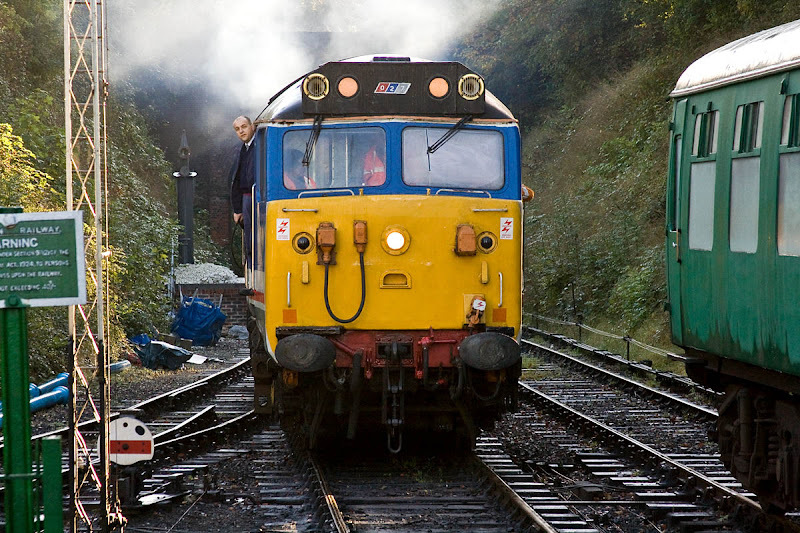 Running around at Alton onto the stock for the 10:20 train to Alresford. 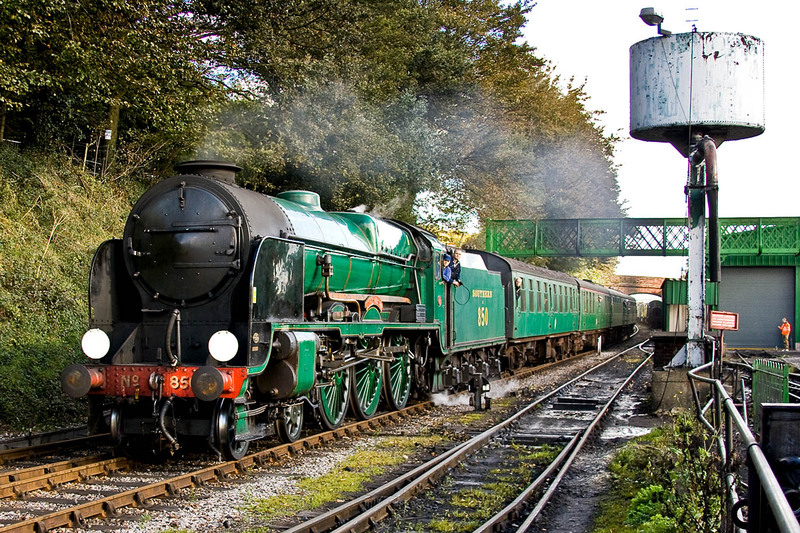 Leaving Ropley with the first train, smoking 50 style. 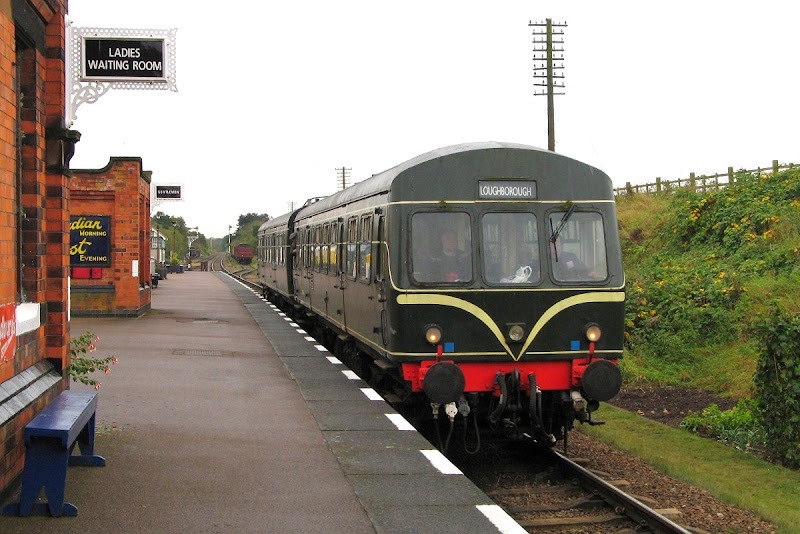 Departing from Alresford at 14:20 with the third train. I can see that Fotopic servers are running again for a while, giving opportunity for former users to rescue photos, by means of download of zip file. I didn't lose any pictures, but have used the download facility to place these archives to place into other backups. Thanks to the Fotopic Legacy Team! 47818 (new in December 1965 from Brush as D1917, later 47240 and 47663) leads 5Z67 approaching Shawford from Eastleigh. The mission today was to London Euston for the filming of a Debenhams commercial for Christmas. 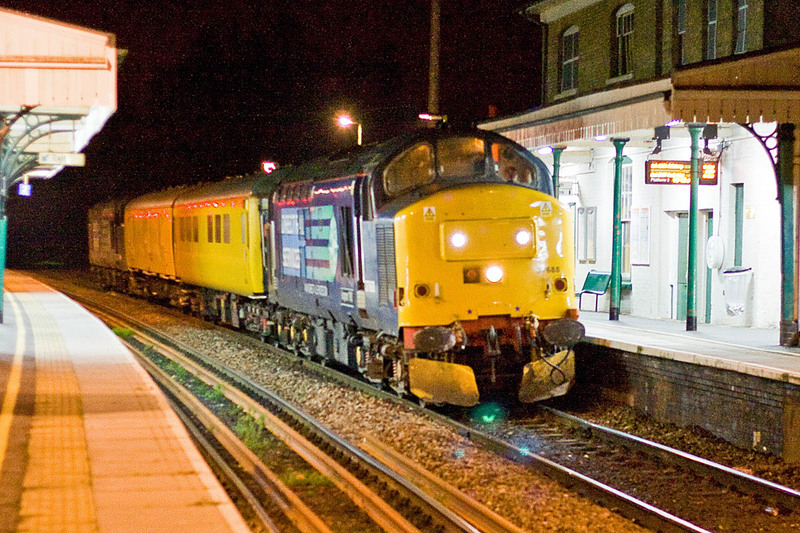 Will the 47s be out of shot? 47802 Pride of Cumbria (new in September 1966 from Brush as D1950, later 47552) on the rear of the train. The test cars were 6264, 977868 and 999508. 6264 is a generator van converted from BG 80971 (York 1956) later 92923. 977868 is a radio survey coach coverted from Mk 2E TSO 5846 (Derby 1972-73). 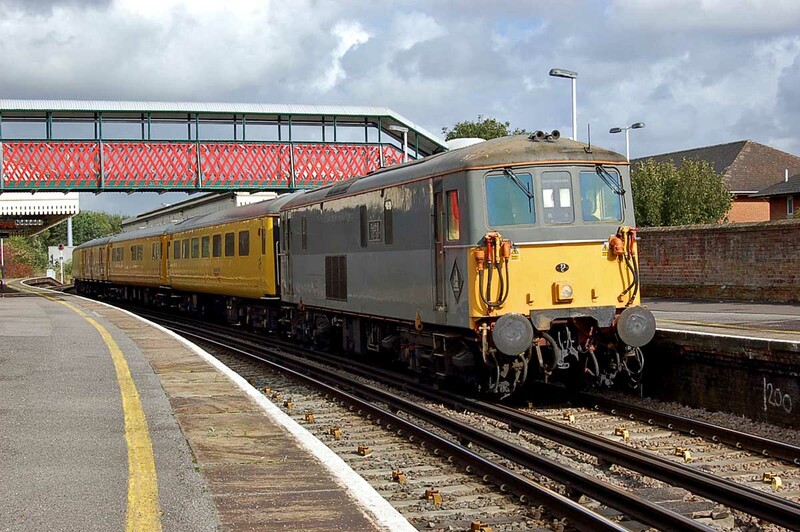 999508 was formerly a BR built inspection saloon (Swindon 1960) and continues as a track inspection coach. Why no DBSO? 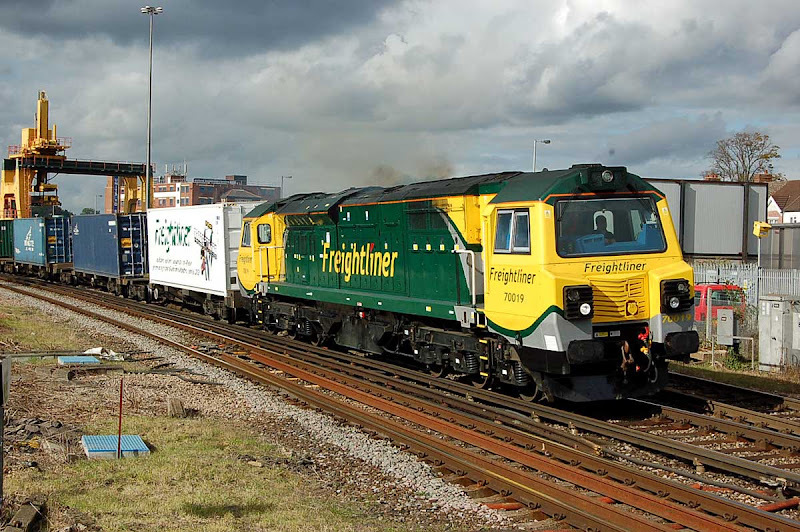 Hamworthy stone terminal reported to have closed 28th September. 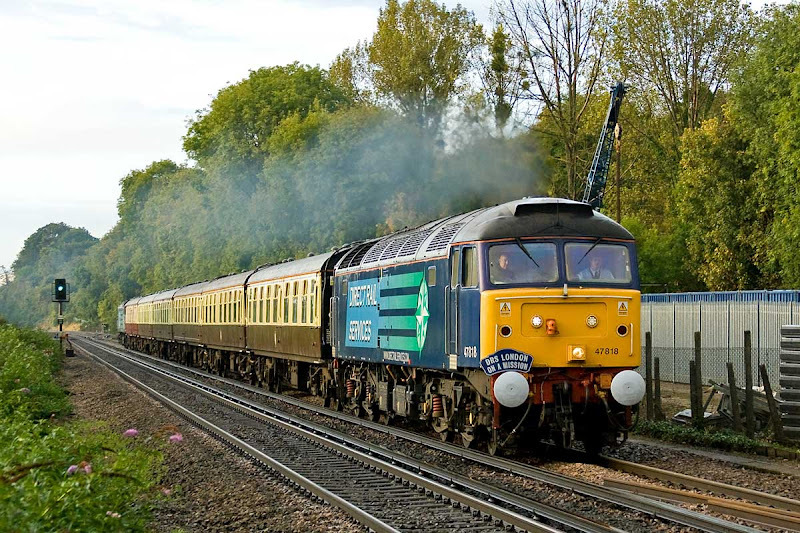 Eastleigh to Hoo traffic is now in the hands of Freightliner, using the locomotives seen being transferred on Saturday 29th September.